Art projects that are fun for children and adults. Art copyrighted Vicki Smith. Here's a fun way to introduce children to a simple printmaking project and create a handsome piece of art at the same time. 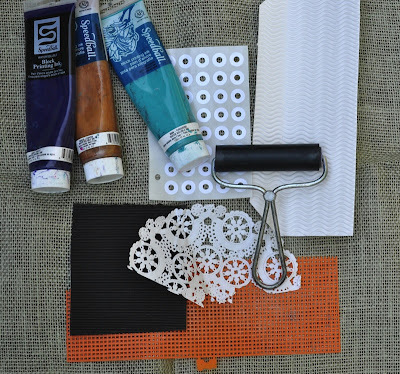 Small sheets of colored tissue paper are placed on top of the different textures pictured. Printing ink is rolled over the tissue using the brayer and capturing the image of the texture. Spray glue attaches the sheets of tissue to a stretched canvas. Voila! Fun and pretty. I am an artist + illustrator. I also teach art classes part time for children. Please contact me if you are interested in using any of the images. Please visit my shop at vickismithart.etsy.com. Thanks!